With the sinking of MV Princess of the Stars, all authorities, government agencies, and the companies involved in this tragic incident that made the Philippines infamous once again has embarked on a new game--The blame game. 1. The Filipino people, I believe, blames Sulpicio Lines for sailing even though they knew that there was a typhoon. 2. 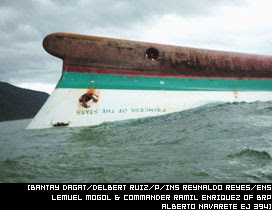 Sulpicio Lines blames the Coast Guard for allowing them to sail even though they knew that there was a typhoon. 3. Sulpico Lines blames the weather bureau for not predicting the path of the typhoon properly. Hence, they unwittingly sailed through the eye of the typhoon. Killing 800 people and possibly polluting the whole region with the pesticide endosulfan. 4. The Coast Guard blames Sulpicio Lines for not telling them about the 10 metric tons of the endosulfan in their cargo. 5. Sulpicio Lines blames Del Monte for not telling them about the endosulfan and for not specifying that it is highly poisonous. 6. Sulpicio Lines blames the Coast Guard for not asking them whether or not they were carrying endosulfan. Endosulfan is not on their list of dangerous chemicals. 7. Del Monte blames Sulpicio Lines because "Under the law, Sulpicio must exercise extraordinary diligence in ensuring that all cargo arrive safely at their destination," Del Monte said. 7. Bayer Philippines says "what endosulfan?". They stopped producing it in 1991. 8. I even read some comments that the people on the ship should not have taken the ship knowing that there was a typhoon coming. This implies that the tragedy was actually the fault of the passengers themselves. 9. PAGASA, the weather bureau, will probably blame the "brain drain" of their meteorologist to Singapore and other developed countries for their inability to correctly predict the path of the typhoon. In my opinion it is the fault of everybody that 800 people died that day. 1. It is the fault of Sulpicio Lines for sailing knowing there will be a typhoon. They do have enough experience to know. Three other ships they owned perished the same way. 2. It is the fault of the Coast Guard for letting them sail. 3. It is the fault of PAGASA for not accurately predicting the weather. 4. It is the fault of Del Monte for shipping endosulfan in a passenger liner. 5. It is the fault of Bayer for still selling endosulfan in the Philippines when has been banned in most countries. 6. It is the fault of the Philippine Government for losing all its talented and skilled people to the brain drain. It is also the fault of the government that the shipping industry is not well regulated. In a country of 7100 islands, this is just unacceptable. 7. It is the fault of the Filipino people for forgetting too quickly what happened to Dona Paz, Dona Marilyn, MV Princess of the World and MV Princess of the Orient. If we don't want these tragedies to happen again then we should be more vigilant in preventing them. Why is Sulpicio Lines still in operation anyway after all these tragedies? We should demand good service from companies, and all government agencies tasked to monitor them.